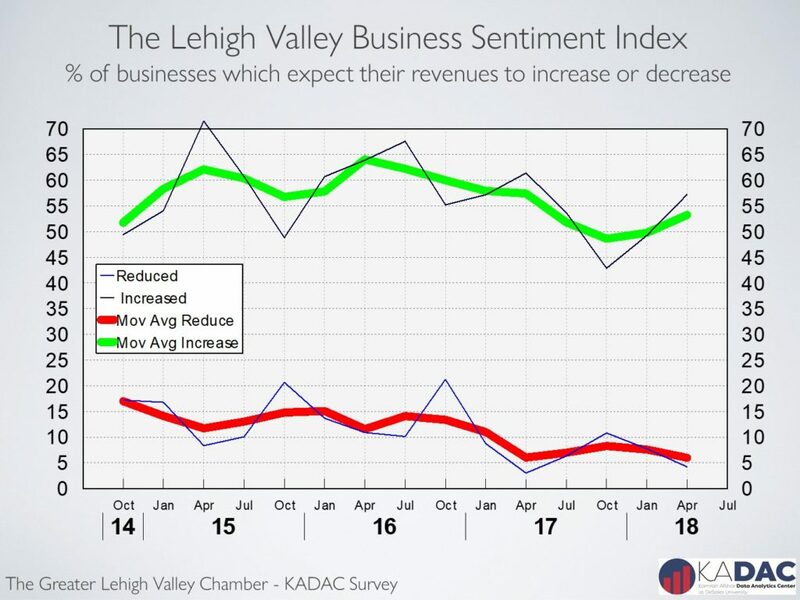 The Greater Lehigh Valley Chamber of Commerce -Kamran Afshar survey of the Valley businesses is a quarterly survey that has been conducted since 1998. In April 2018. 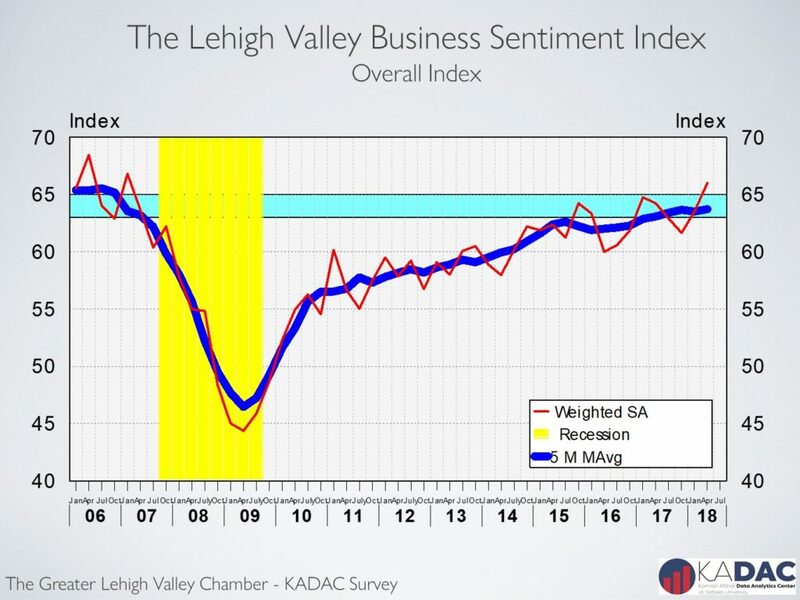 The business sentiment index in the Valley rose to its highest level since 2007! The index of hiring plans for the next 6 months with an increase of 6.9% over its January 2018 level recorded the largest increase among indicators in the model. Employment in the last 6 months also recorded a significant increase in the April survey. The purchasing indices, however, both showed small increases in 2018, while remaining below their April 2017 levels. The index of hiring plans for the next 6 months spiked to 69.9 in April, its highest level since July of 1999! This index is now at the top of the range which is historically associated with rapid employment growth in the Valley. The index of actual hiring over the last 6 months also recorded a significant increase in April 2018, exceeding its April 2017 level by 7.1%. This index is also in range associated with rapid employment growth in the Valley. Valley businesses participating in the survey have reduced their layoff rates to below their boom years level during 2004 through 2006. A data point which is directly supported by the decline in the number of initial unemployment claims which has now dropped to tight labor market level for the Valley. The index for actual purchases over the last 6 months while increasing during the last two quarters, is still below its last year’s level and is trending flat. The rapid increase in purchasing during the first 2 quarters of last year appears to have been mostly due to post election enthusiasm. Many of the same businesses have cut back their rate of expansion. One of the surprising results of our surveys is the observation that the percent of local businesses which had reported increases in their revenues dropped well below its January 2018 level and is at a statistical tie with its April 2017. Also, of concern is the drop of the index of expected future revenues to below its April 2017 level. The lower corporate and personal income taxes have moved from the roam of expectation to reality. The trillion-dollar infrastructure bill or anything resembling that is still an expectation. And while we will see increases in consumer and corporate expenditures, at least, through the middle of summer, its sustainability beyond that is being debated. It is however, very clear that the current tax breaks, will cause higher deficits, at the very least, early on. Since the labor market is at full employment level, and deficit is rising rapidly, inflation and higher interest rates are not far behind. 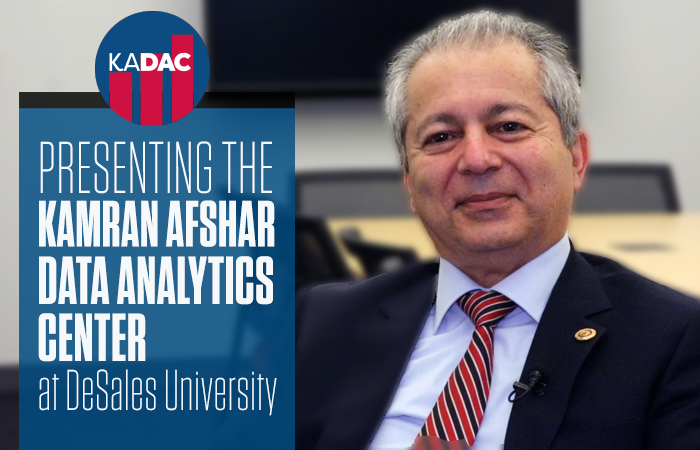 DeSales University is joining forces with Dr. Kamran Afshar, a leading economist, on a groundbreaking new data analytics center that will put students at the forefront of research and consulting. 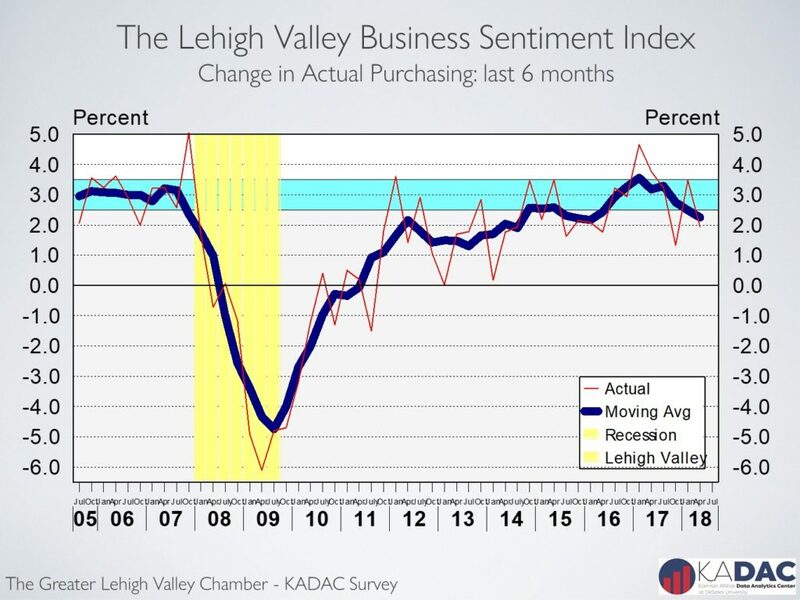 To get a perspective more focused on our area, WFMZ contacted Dr. Kamran Afshar, the Chief Economist for the Greater Lehigh Valley Chamber of Commerce. Despite an air of uncertainty about the new Trump administration and its impact on Lehigh Valley businesses, speakers at Tuesday’s Greater Lehigh Valley Chamber of Commerce’s annual Economic Outlook luncheon sounded mostly upbeat notes, with a few words of caution. Economist Kamran Afshar, PhD, of Kamran Afshar Associates, Inc. (KAA), examined the state of the economy, both local and national, during a presentation Wednesday afternoon at the LC Bar Association in Allentown. According to Afshar, Lehigh Valley businesses during the monthly of April saw the largest drop in the index of future purchases. In terms of hiring the last six months, there has been a slight drop. The number currently is about 12 percent, compared to 10 percent before the Great Recession. “However, the number of business who have actually increased the numbers of employees is significantly higher than those that have reduced the number of employees they have,” he said. Afshar also provided a forecast for hiring in the Lehigh Valley. The causes, he said, are due to businesses beginning to become concerned with events that are occurring, and as businesses hire more employees they run out of the type of employees they seek to hire at the prices they are willing to pay. 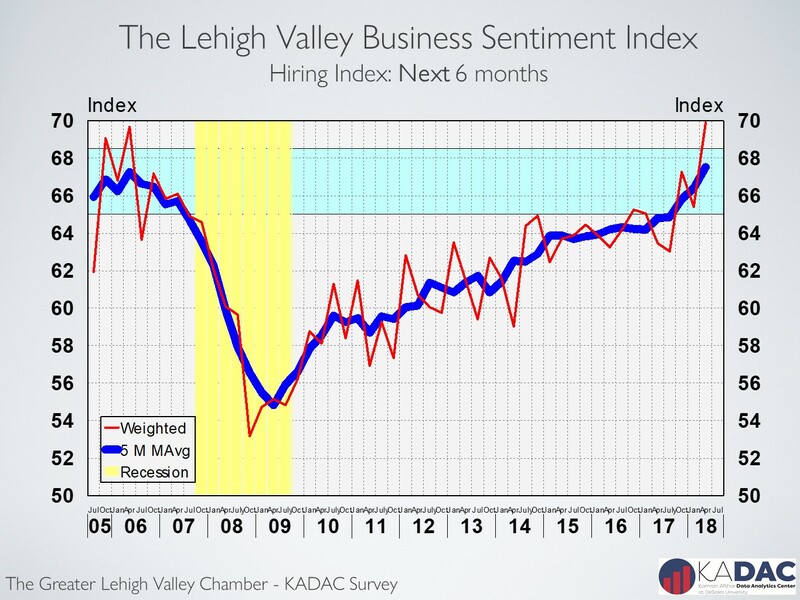 Unemployment in the Lehigh Valley has decreased, Afshar also said, noting about 20,000 individuals are currently searching for employment. Unemployment will continue because individuals out of the employment market are not equipped to handle changes associated with certain jobs. “At least for the next seven months you are going to see a tight labor market,” Afshar added. Nationally, according to Afshar, the Gross Domestic Product, which crashed during the Great Recession, did rebound but then leveled off between 2 and 4 percent. Afshar noted the economy typically “gets hot” when growth moves beyond 2.5 percent. Almost 200,000 new jobs have been created every month. Since the start of the economic recovery, 80 percent of all the jobs created are full-time jobs, not part-time. Those unemployed for 27 or more weeks, at one point, numbered 7 million. That number has dropped to about 2 million. Adjusted for inflation, real wages increased over the past 38 years from only $41,000 to $42,500, which amounts to 4.4 percent. “Real wages have not increased,” he said. The causes, he said, are due to the automation of manufacturing, which require fewer employees to do a job. Local employers’ spending and hiring outlook declines in Bethlehem economist’s index. Presented by: Kamran Afshar, Ph.D., and Buddy Lesavoy, Esq. February’s 0.2% inflation was mainly caused by higher food and energy price as well as increases in shelter costs. However, thanks to lower oil prices, inflation over the last 12 months was 0.0%.